There are more than enough good projects for improved transportation in the Lower Mainland already in the planning stage so high speed rail to Seattle would not seem to be a good use of resources. Vancouver Coun. Jean Swanson wants her colleagues to support a campaign that would have children up to 18 years old ride free on transit. Swanson's motion goes before council on Tuesday and asks that the city write a series of letters giving formal support to the #AllonBoard campaign. In addition to free rides for youth in Metro Vancouver, it also calls for monthly pass fees based on income and an immediate end to the ticketing of minors for fare evasion. If you are caught on TransLink without a valid fare, the fine is $173. ..13 min video. the argument is well presented. There are over 100 cities around the world with fare-free public transportation systems. UGA Transit right here in Athens, Georgia has been fare-free for decades and would never go back to charging a fare. Why have all these cities and universities stopped charging fares? Are there benefits to going fare-free? The answer is yes! Hopefully, the rest of Athens will ditch the fare-box soon, but there are some things to be negotiated first. BREAKING: The next Scottish Labour government will extend free bus travel to under 25s, with a long term goal of universal free bus travel. ..good discussion and planning. part 1..30 min. There is a really easy means to finance free public transit. The city of Morden, Manitoba is providing free internet to all citizens. Copy but provide it at 30$ a head, free for low income, and there is the money for free public transit. The left needs to heavily promote wins that prove leftist ideas and socialism do not impoverish people they enrich them. Win that battle and we are on the way to dismantling neoliberal philosophy and taking power away from those who would privatize everything. What Pondering says about internet service is true. Bandwidth is almost unbelievably cheap at wholesale, and the phone and cable companies are charging rates which amount to markups of thousands of percent. For example, I pay around $90 per month for 275GB of bandwidth from Cogeco. That's about 33 cents per GB. I also rent a virtual server from a U.S. company called Linode for $10US, say $14Cdn per month. This includes not only the server itself, but also 2,000GB of bandwidth. That's about .7 cents per GB. Those are the very same bits, on the very same internet backbone. And Linode is making a profit even at less than a cent per GB, they're not providing this bandwidth at a loss. So, Cogeco is marking up a price that is already profitable for Linode by an additional factor of 47, that is 4,700%. I like this and it makes intuitive sense. 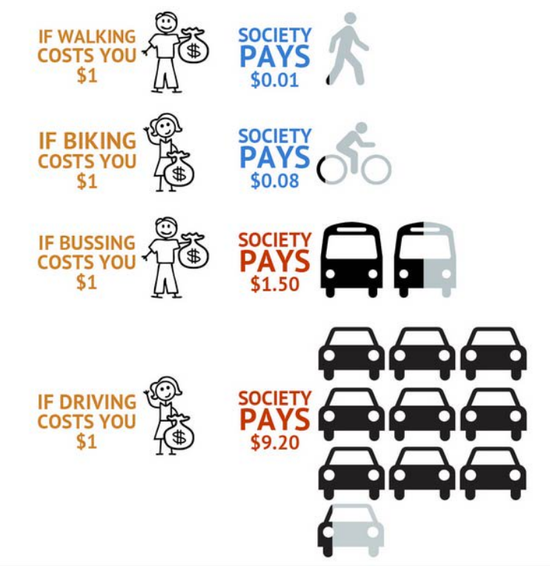 Miles of pavement costing more than sidewalks or bike lanes. Busses distributing the cost to all passengers. However I am curious what the backup for the numbers are. ..can't remember where i got it pogo. sorry. i suspect though that the car subsidy is quite a bit higher than the $9.20.